* The socket() function creates a new socket. * 1) AF_INET: address domain of the socket. * 3) Third is a protocol argument: should always be 0. * If the socket call fails, it returns -1. 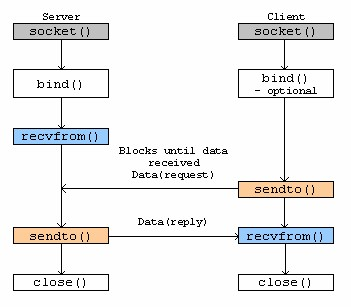 * The variable serv_addr is a structure of sockaddr_in. * sin_family contains a code for the address family. * It should always be set to AF_INET. * the machine on which the server is running. * to a port number in network byte order. * This function is used to set the socket level for socket. * It is used to avoid blind error when reuse the socket. * For more info, see the url. << "- Error binding connection, the socket has already been established..."
* on the socket for connections. * until this char ('*') arrives. cout << "\n\n=> Connection terminated with IP "
* from presentation (textual) to network (binary) format. * If the comunication is on the same machine, you can comment this line. * the server but not its own port number. * the user write '*'. * socket connection and the client connection.